This little mini quilt has been on my mind since seeing it on crazymomquilts. It was tricky to piece, none of the pieces fit together, and none of them were exactly the same size, but after some snipping and adding, I really like the way it turned out. I quilted around each color block so they kind of pop out. I think I’ll hang it on the wall, it adds just enough color without being the first thing you see. The tutorial is here if you want to make it yourself. Yes, the crackers will really make the orange in the quilt “pop.” :) Ah, the life of a quilting mommy. i love, love, love this!! Aw, I love how this turned out! It looks like artwork hanging on your wall! 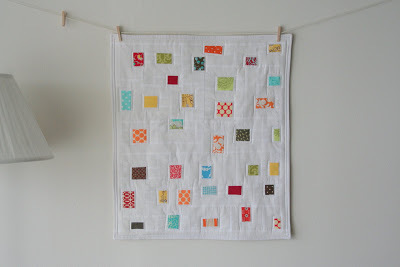 This is my kind of quilt.. one where the blocks are NOT all exactly the same! I really love this. I want to try it but since it would only be my second quilt attempt, I am not sure I can plug in extra pieces or get these to fit together at all. I just love the result though. I made one of these, too. Check it out on my blog!